Why Do Goldfish Spin Themselves Around in Tanks? Overcrowding contributes to poor goldfish health. Goldfish rarely swim fast, except at feeding times. Sudden, rapid movements -- like swimming in circles -- usually mean your fish are in stress. In fact, swimming in circles is a classic symptom of ammonia poisoning. If your goldfish are doing this, you will need to take immediate action. Ammonia poisoning can produce a number of symptoms, and not all goldfish react exactly the same. Spinning in frantic circles is a major tip-off, though. But you may also see lethargic goldfish hiding in the recesses of the aquarium. Frantic darting movements also show up. You may also see goldfish gasping at the aquarium surface, or rapidly flapping their gill covers. Often, ammonia poisoning can kill goldfish. If a number of fish die in rapid succession -- and there's no obvious sign of disease -- you probably have an ammonia poisoning problem on your hands. All fish produce ammonia as a biological waste product. In a healthy aquarium, bacteria break down ammonia into less harmful nitrite, then more-or-less harmless nitrate. However, when this process goes wrong or hasn't had time to get started properly, ammonia and nitrite build up in aquariums. 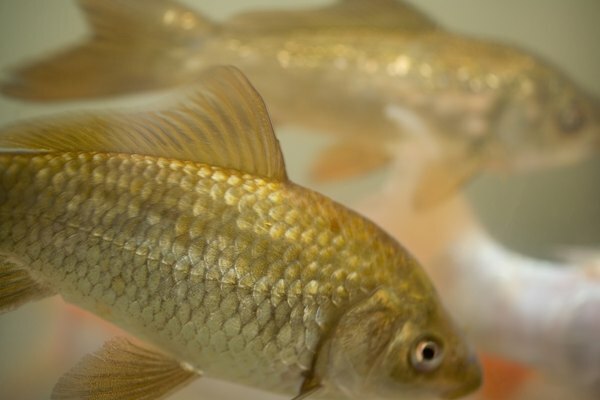 These chemicals can burn goldfish's tissues, especially gills. The damage to the gills makes it hard for goldfish to respire and actually makes it harder for them to excrete the ammonia they produce, causing it to build up internally. Ammonia can overcome an aquarium in a number of ways. The main way is the biological waste that fish produce. You can cause excessive ammonia, too, by overfeeding, since extra food rots and pollutes the aquarium. If you don't remove dead goldfish or plants right away, they also rot and foul the water. One of the biggest causes of ammonia in goldfish aquariums is overstocking. Most people keep too many goldfish in the same aquarium. Ideally, you want to keep only a single goldfish per 30 gallons of aquarium volume. A greater density will tax a fish tank's ability to perform biological filtration and promote ammonia problems. In the short term, the only thing you can do to control ammonia is to perform water changes on your aquarium. You can prevent it by not overfeeding or overcrowding your aquarium and removing dead fish or extra food quickly. It's very important to take your time when adding goldfish to an aquarium. Add only one fish at a time, then monitor ammonia and nitrite levels, which should rise and fall. Once nitrite levels have hit 0 ppm, perform a 25 percent water change and add the next fish. Do not rush this process. What Kinds of Treats Do Fantail Goldfish Like? Is It Good to Add a Second Goldfish After a Year? Can I Feed a Fancy Goldfish Grapes? Why Would My Goldfish Be Bloated?